If you live in postcode areas bounding the Settle-Carlisle line, between Skipton and Carnforth or between Carlisle and Brampton or in Clitheroe/Whalley, you can purchase a Dales Railcard which will enable you to receive discounts on the price of tickets to travel on the line. You can buy up to four cards in one transaction for yourself and/or other eligible people. *How many railcards do you wish to purchase today? Now, please enter the details of the railcard holder(s). *Please select this applicant's postcode, so that we can check they are eligible. Please note, all railcards will be despatched to one shipping address. You can specifiy this when you check out. If you live in postcode areas bounding the Settle-Carlisle line or between Skipton & Carnforth and between Carlisle & Brampton or in the Clitheroe/Whalley area, you can purchase a Dales Railcard. The railcard enables you to receive discounts on the price of tickets to travel on the Settle – Carlisle and Bentham lines. You can use a Dales Railcard to save money on single, day return and standard open return tickets. Travel validity is between all stations shown on the map (below), (plus Brampton and Wetheral on the Tyne Valley line) and between Clitheroe / Whalley and Hellifield (Sundays only). It cannot be used exclusively within the Leeds / Bradford Skipton area or exclusively between Carnforth, Lancaster, Bare Lane and Morecambe/Heysham Port. How long is the Dales Railcard valid? 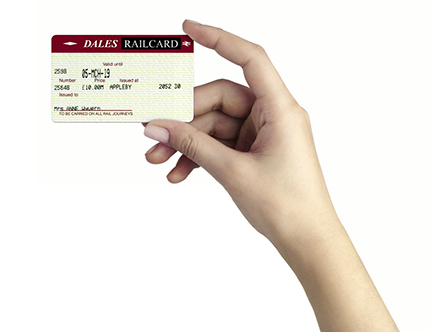 Dales Railcards are valid for twelve months from the date of issue or commencement date. You can apply up to one month in advance for a renewal Dales Railcard but please allow 7-10 days for delivery of the railcard when ordering on this website. Can I Use the Order Acknowledgement or download the Railcard to get the discount? No. Your Dales Railcard will be posted to you. Please remember to allow at least seven days for Dales Railcards purchased online to be processed and delivered via Royal Mail. You must present your Dales Railcard when purchasing tickets and carry it with you when travelling. Railcards can only be used by the person named on the card. Improper use may result in seizure of the card and/or prosecution. How much can I save on rail fares? You cave 1/3rd on the cost of single, day return and standard open return tickets between valid stations. What other benefits are available with the Dales Railcard? 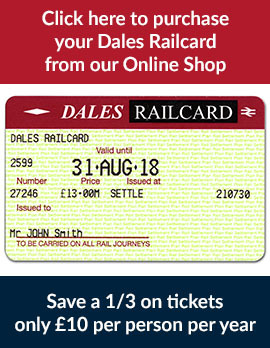 Dales Railcard holders will be able to take advantage of the annual winter offer. To be eligible, you will need to present your valid Dales Railcard. Railcards can only be used by the person named on the card. Improper use may result in seizure of the card and/or prosecution. Promotions are subject to terms and conditions stated by the business. Register your email address with us to receive our newsletter to stay up to date with the latest offers.